It is a common misconception among people who never read the series, that all the books are similar and simply about the games. They don't realize that the games are just a small part of what is happening in Suzanne Collins futuristic world of Panem. If you've only seen the first film, and you're thinking that the rest are just the same thing in another setting, you couldn't be more wrong. Normally I would give a synopsis of the story before I review the film, but it's difficult to do without spoilers, so I will say, that Mockingjay couldn't be more different than the other films/books. There are no games, but the story does follow some of the people you met in the games. Once again, this film is like a page for page telling of the book in such a way that I've never seen before or since. When you read a book, often times you get pictures in your head of people, places, and things. When those films are transferred to the screen, most of the time, what you pictured in your head is not what you're seeing on the screen. The Hunger Games is different, because it really is like Suzanne Collins was in my head when I was reading the book and transferred my thoughts to film. It's what I loved about the first two films, and that hasn't changed in the third movie, despite a new Director. Once again, Jennifer Lawrence stars and continues to be the perfect choice to play Katniss Everdeen. Years ago, when I first read the Hunger Games books, I thought to myself that if this ever became a movie Jennifer Lawrence would be the perfect choice to play Katniss and apparently Collins had the same thought. 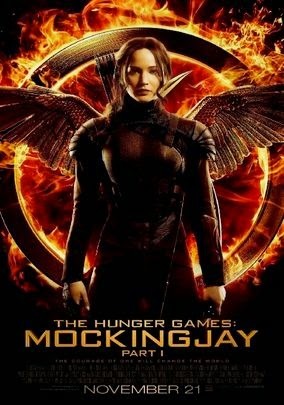 Lawrence is the focus of the film and with all of America and Panem watching her, the Mockingjay shines, as both the face of innocence and as a leader to her people. I've read a lot of books before I've seen their film adaptations, but never has a story jumped so vividly from the pages to the screen. This series continues to be exciting, inspiring, and just plain terrific. If you're the kind of person who is turned off by sequels, don't let that stop you from catching up with the Hunger Games, because every film is just as good, if not better than the film before it.